Below is the list of one hundred books recommended by the computer model in The Bestseller Code by Jodie Archer and Matthew L. Jockers. Join us as we read and discuss the novels. Links in the list go to the landing page from this blog, which is where the discussion starts. This is an open-ended challenge, so feel free to jump in with any of the books at any time after the discussion begins. Note: The list is subject to copyright and is used with the author’s permission. *Title links go to Amazon for more information about the book. Disclosure: I am an Amazon affiliate. 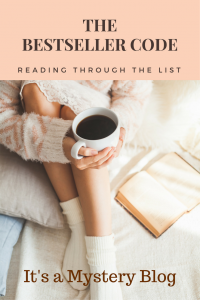 Note as of 2/2019: After careful consideration, Karen and Roberta have decided to discontinue reviewing or analyzing novels from The Bestseller Code list online. We’ll continue to read selected novels on our own schedule, but won’t be posting our comments. Thank you to everyone who has followed along and shared your thoughts. Genre: Somewhere between literary mystery and psychological thriller. Note: this book was originally published anonymously. Note: Also published as The Other Hand. Note: This is the third book in a series. Note: Won a Pultizer Prize for Fiction in 2009. Won the Pulitzer Prize for Fiction in 2013. 70. The Brief Wondrous Life of Oscar Wao by Junot Díaz (2007) – Discussion began December 26, 2017.